Christians are still being persecuted in Iraq and the threat of extermination must not be forgotten, according to a priest from the region. Fr Daniel, 27, was in London this week to brief MPs, Peers and church leaders about the ongoing crisis in Iraq. 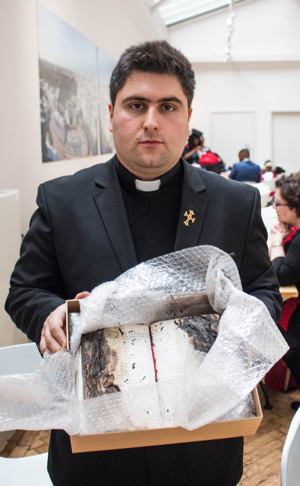 He handed prime minister Theresa May a scorched Arabic Bible recovered from Karamles near Mosul, Iraq, to as part of the campaign to raise awareness of the plight of persecuted Christians in the Middle East. According to a report by the charity Open Doors, the charity that supports persecuted Christians, more than 100,000 Christians have left Iraq since the conflict with IS began in 2014, while as many as half of Syria’s estimated 1.7 million Christians have fled the country since 2011. Fr Daniel, urging MPs and Peers to sign a petition calling for help for Christians in Iraq and Syria, referred to the “systematic extermination” of Christians in the region. He said the persecution was still continuing. He said: "I ask you, your people and your governments on behalf of the Christians of Iraq, please do not forget us. Please help us to rebuild our country, our society, our cities, our destroyed villages which were destroyed by ISIS. Please stay in solidarity with us, and please pray for us. And in order to be given a big role in peacemaking and rebuilding our country, because we are still the salt of the earth. And even if we are fewer, we still have more influence than our size. And we may forget the one who persecuted us, but we won't forget the one who stood with us." He urged: "We still believe that we can and must have a dignified and constructive role to play as children of God and in our homeland." Fr Daniel said: "Many people have used the word genocide to describe what happened to my people and to the Christians of the Middle East. It is a systematic extermination of Christians in the Middle East. Please don’t consider my people like a piece in a museum because my people are human beings that have a history, that have a dignity and we are creative. We are people who love to live in peace which we lost a long time ago." Open Doors confirmed to The Tablet that even though IS has been driven out, extremists are still operating there. The petition, Hope for the Middle East, has already been signed by more than 800,000 people from 143 countries and was also presented to the United Nations in New York on Tuesday. It calls on governments in the region to improve the living conditions of refugees and internally displaced peoples, protect citizens’ rights and equip religious leaders to help rebuild societies. Earlier that day, 85 people in nativity costume gathered outside parliament to promote the petition. The group of men, women and children dressed up as Mary and Joseph, and recreated the nativity scene en masse in Parliament Square Garden. Foreign Office minister Alistair Burt said one of the big challenges where people were returning to their homes was, what are they actually returning to? “Returning people to areas where they will be insecure again? How do we deal with that? You take people away to places of safety, what does that mean for the continuance of the christian community in the areas where they are driven from? The report also highlights that it is not just recently that Christians have been targeted in the region, but since the 1990s. It is estimated that 20 years ago Iraq had a Christian population of 1.2 million, a figure which has dropped by around 80 per cent to between 200,000 and 300,000. Fr Daniel said: “How faithful people who received their Christianity in the first century from the apostle Thomas could disappear in so short a time will become a matter of study and debate for historians and politicians no doubt.